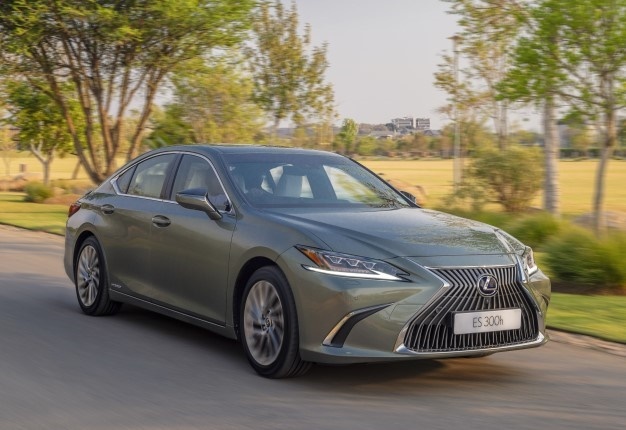 The seventh-generation Lexus ES ticks all the boxes as a premium sedan with an improved chassis, new design and better driving performance. With its spindle grille front and centre, the new Lexus ES cuts an imposing figure. The nameplate might be on sale since 2013 in South Africa but this midsize sedan has never set that segment alight. Image-conscious locals prefer to spend their money on BMW’s 5 Series or the Mercedes-Benz E-Class. That could change in 2018 as the ES gains a new stylish design, improved tech and enhanced powertrain. For 2018, the ES range comprises two models - ES 250 EX and the range-topping ES 300h SE. The latter is a hybrid model featuring a combination of a 2.5-litre naturally aspirated engine and an electric engine, together they produce 160Kw and 221Nm. At just under five metres long, the ES plays in the same part of the park as medium luxury sedan segment, the price entry point however is R593 300 and tops out at R843 800 for the hybrid model. The ES is car that doesn’t like to be rushed, it’s more orchestral in the way it delivers its power. The four-cylinder engine can feel strained at times but if you modulate the throttle well and drive like any sane person, the 152kW feels more than adequate. The heavily-weighted steering thankfully doesn’t feel artificial and you sort of know what the front wheels are doing. Both cars are front-wheel drive. The 250 employs an 8-speed automatic gearbox while a CVT ‘box is part of the hybrid system. There’s no doubt that the conventional torque converter box goes about its business far better than the ‘droney’ CVT. There are paddle-shifts located on the steering wheel for perhaps a sportier way to change gears, but the personality of the car doesn’t lend itself to that. Nope, you’re better off just gliding around in this serene luxurious Japanese sedan. Using the entirely new GA-K platform for the car has a lower centre of gravity compared to the previous generation. Sport mode failed to light my pants on fire, but I don’t think that’s what Lexus engineers are hoping for, the ES goes about its business without fuss and that’s a good thing. The wheelbase has been extended by 50mm resulting in more knee room and shoulder room. Both cars mercifully do not ride on massive wheels. The 250 has 17-inch wheels and the 300h rides on 18"wheels, it makes the ride suppler and more luxurious. Lexus says the 250 is likely to be the more popular model and they’re hoping to sell around 30 units a month. The automaker says hybrids haven't gained traction in SA yet. You’ll immediately recognise the new ES because of its ‘spindle grille’, giving it an imposing and handsome face finished off with chrome and sharp LEDs. The rear styling has a lot more presence, the 300h even adds a rear spoiler for the ‘sporty’ look. Move inside and the quality of materials are excellent, the rotary controls for the three driving modes (eco, normal and sport) and the traction control are now located above the digital instrument cluster. A large central screen houses all the in-car entertainment and navigation (300h only) services, but the ‘track pad’ that’s used to navigate the various options is slow and lacks the swiftness of using a rotary controller. Lexus says the new ES also features a 3D painted finish on the armrest and centre console for the first time. Pretty neat. Have a closer look at the specifications and details of the new ES here. Although this is the seventh-generation ES, only the last two iterations have been on sale in Mzansi. And while Lexus doesn’t have lofty sales targets for the ES, the luxurious Japanese sedan has the potential to stand out in the crowd. Both models are heavily kitted out with toys, the 300h even has electric seats in the rear, and that might give them an edge when it comes to buyers in the segment keen on extracting value instead of ticking the options list for a few niceties. Lexus now offers their models with a seven year or 105 000km warranty and full maintenance plan.